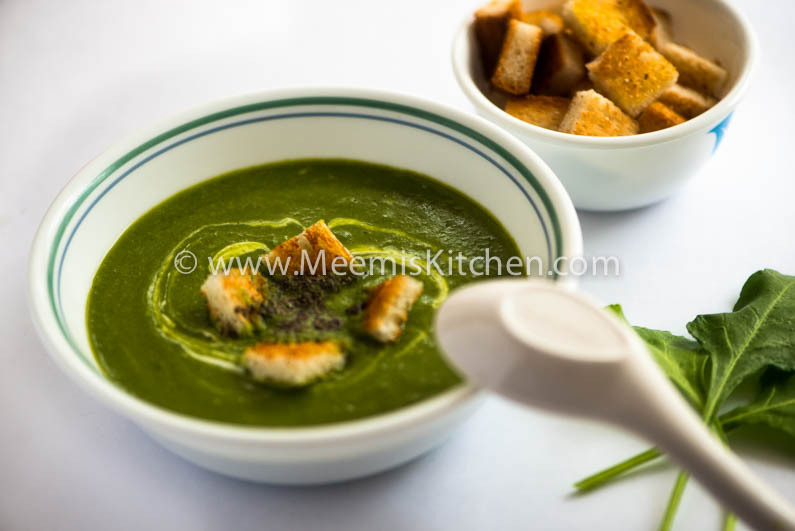 Palak Soup is a very nutritious, simple yet delicious soup and a great appetizer. The onion and garlic in Spinach / Palak Soup give great flavours and the green chilly and pepper spices it up. I first had Palak Soup in Dubai when Beenchi (my sis) made it for me. The lush green colour of the soup and white cream on top was much appealing but I didn’t like it very much then. One time, in a hotel in Chennai, saw somebody ordering the Palak soup and I wanted to have as well. It felt good and I started experimenting on it. 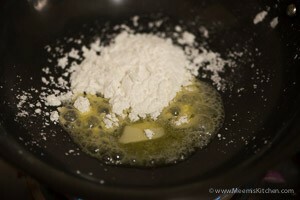 This recipe for Spinach soup is what I liked the most, as the cornflour brings a different taste altogether. It is very easy to prepare and a great soup to have with croutons. Soups are healthy and easy to make at home. Vegetable soup,Tomato soup, Mushroom Soup, Chicken soup, Manchow soup all can be easily made at home. For kids, add some fried noodles or croutons to make it more appealing! It is pretty cold here in Bangalore and Palak soup is what I decided to make to beat the cold weather. I grow Palak in my balcony garden and so fresh Palak is readily available. Dark green Palak is very healthy and is considered as Super food. It is great and healthy for your skin, hair and bones. Spinach helps to control diabetes and Blood Pressure and is rich in iron and other minerals. Make your children eat more Spinach/ Palak like “Popeye the Sailor”, the famous cartoon character. Try Palak Paneer, Cheera Parippu Thoran or add spinach to their favorite Pasta. For today, it is fried croutons and the yummy hot soup.. Feeling great!!! Garlic cloves : 2 nos. Wash, clean the Palak and pressure cook with small onions, Green chilly, 1 glass water and pinch of salt just till the first whistle. Heat half of the butter and sauté chopped onions and garlic. Grind/ puree the onion mix and cooked palak and keep aside. 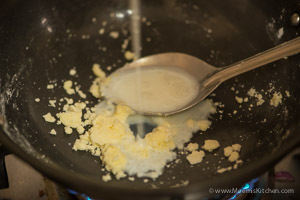 Heat the remaining ghee add cornflour and stir in half milk. 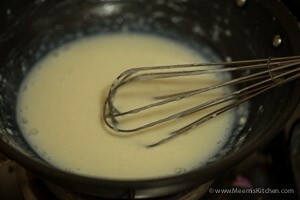 Stir with egg beater and make a smooth paste adding the rest of the milk. 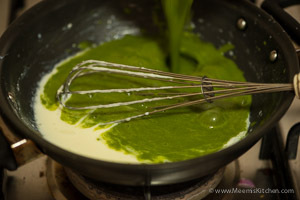 Add the Palak puree to this and bring to a boil, adjust the salt. Serve with cream (optional) and croutons (Toasted bread cut into small pieces). Palak should be fresh. I have used the stalks as well. 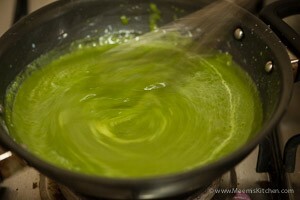 Onion and garlic can be boiled together with the Palak to make puree. I liked the sautéed one. Enjoy a great healthy soup. God Bless! !